A few weeks back I took the week off for a vacation that amounted to just hanging out with the family and taking a few day trips. I also made it a point to visit the local flea market that happens on Wednesdays and I usually miss due to work commitments. Overall, there wasn't much happening on the record front, except for a box of 45s that was being pulled by one of the last tables as I was making my way out. Now it was a box of unsleeved 45s, which I generally avoid, as the records generally are worse for wear. But having no luck and no need to rush home, I figured it was worth the look. 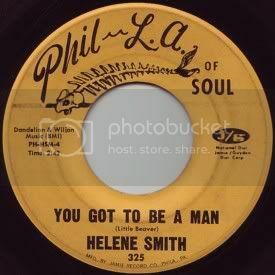 I'm glad I stopped, as I stumbled across this 45 by Helene Smith I had been after. I didn't realize it until after some research that this record had been released on Deep City Records out of Miami, and was picked up by Phil-La of Soul for national distribution. This tune is propelled by the bass, which is up in the mix, right behind Helene. The drums also support the tune, as well as the organ that seems to be just bubbling under everything. The horns come in after each line, as if to pace the tune. All these musical elements come together for a quick break, and then right back to Helene, and the tune continues on. I love how straightforward this song is. And, believe it or not, the marks on the record resulting in the noise in the background adds a nice bit of grit to the message. Numero Group released a comp of Deep City as part of the Eccentric Soul series. I got a copy last week & it is highly recommended. Click here for details.